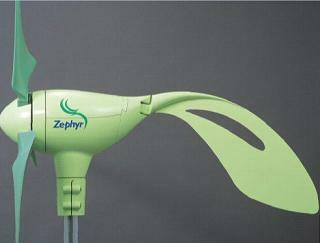 The Zephyr Airdolphin Z-1000 was an excellent but expensive micro wind turbine designed for the domestic market and developed and manufactured in Japan by Zephyr Corporation back in 2005/6. It is now marketed as Airdolphin Mark-Zero in its 24V version, and Airdolphin Pro in its 48V version. The information in this article originally published in 2007 remains up to date for the renamed Z1000, and we have now added details of the rest of the year 2013 range of Airdolphin wind turbines at the end of the article. The Airdolphin Z1000 has a 1kW rating in 26mph (12 m/s) winds with a cut-in wind speed of 5.5mph (2.5 m/s). Unlike most micro wind turbines, the Airdolphin will continue to generate power in wind speeds of up to 110mph before it cuts-out and it is rated to survive up to 145 mph winds. In order to protect the turbine from damage in high winds, if the power output reaches around 2kW, the rotation of the turbine is automatically stall controlled until output falls below 600 Watts. Therefore, although this turbine will continue to generate power in wind speeds from 20 m/s to 50 m/s, it will only generate 60% of its rated value from 23 m/s to 50 m/s. (It is worth noting that wind speeds in execss of 23 m/s are exceedingly rare in the typical domestic UK setting). The 1.8 metre diameter rotor of the Airdolphin Z1000 is made up of three ultra-light blades (380g each) reinforced with a carbon-fibre skin. Thin grooves are cut into the blades which are designed to reduce the noise of the air flowing over them. These Silent Disrupter Blades were inspired by the wings of owls – well known for their silent flight. The Airdolphin Z1000 can be connected to a battery bank – 500Ah is the recommended minimum size – for off grid power generation, or [was marketed in 2007 to be] grid-tied using a unique patent-pending UK mains electricity connection. 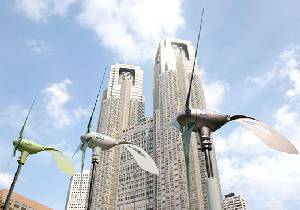 Wind turbines located near to buildings and in towns and cities notoriously suffer from turbulent air (see our article Consumers Disappointed with Micro Turbines. Rapid changes in the wind direction (turbulence) result in micro wind turbines constantly chasing the wind and never quite catching it. The Airdolphin has been designed with a new swing rudder system which goes some way to reducing this problem. The Airdolphin Z1000 weighs just 17.5kg which further assists wind tracking in turbulent conditions. Here is a video of the Airdolphin Z1000 in action in 15-25 mph winds in Scotland. The distributors of Airdolphin do not recommend that their wind turbines are roof mounted on domestic properties (unlike most ill-advised micro wind turbine manufacturers). Instead they offer 6-12m high galvanised tilt towers designed to last at least 25 years to provide a “safe and rigid platform for power generation“. 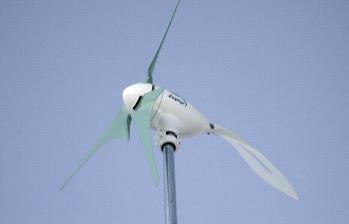 The Airdolphin Z1000 micro wind turbine did not come cheap. An installation survey cost £250 + VAT and a standard residential package £6000-£7000. The package included the micro wind turbine, a 9 metre tilt tower, concrete foundations and installation, cable trenching and laying, a grid-tie cabinet, and the electrical connection. For this money you could expect (according to the distributors) between 500kWh and 1400kWh of electricity generated per year reducing carbon emissions by up to 500kg. With the average price for 1kWh of electricity in the UK at around 11 pence (2007 prices), this wind turbine was predicted to save its owner just £55 to £154 per year giving a pay back period of 45 to 125 years! On that basis we recommended spending a little more money and purchasing a far superior higher power output wind turbine – the Proven WT2500 or similar. Back in 2007 when we originally wrote this article the Zephyr Airdolphin Z1000 was marketed in the UK by Semplice Energy who sold a range of energy saving products; but in 2008 that company was purchased for £1.5 million by the British Gas New Energy division of Centrica. Since Semplice Energy’s official UK Airdolphin website was taken down, we have been unable to find a UK distributor/retailer of the increasing range of Airdolphin wind turbines still manufactured today. Pictured above is the Airdolphin wind turbine range for 2013. As mentioned at the start of this article the Airdolphin Z-1000 is now sold as either Airdolphin Mark-Zero (24V) or Airdolphin Pro (48V), with the Pro marketed primarily to provide independent power sources for remote telecoms base stations. The Airdolphin GTO (where GTO stands for grid-tie optimised) is a slightly modified version of the Z1000 optimised for grid tied installations. This will output up to 260VDC. The Zephyr9000 is a much larger wind turbine weighing in at 325 kg with three 14 kg turbine blades. With its 5.5 metre turbine diameter it is rated to output almost 5kW of power at up to 386 VAC, and 9,000 kWh units of electricity per year with an average 5 m/s wind speed. It is sold almost exclusively in the Asia-Pacific region and used in farming and agriculture for remote power generation.